Alma Intermediate School Newsletter – December, 2014 Click the link to open the full newsletter. 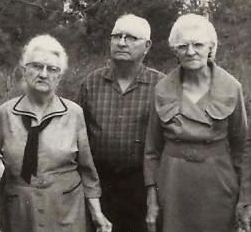 Aunt Nance is on the right, pictured here with siblings Arch Warnock, my grandfather, and Aunt Hettie. As a teaching intern in my last year of college, I was able to visit my great-aunt who lived close to the school. Aunt Nance made me feel special and was interested in what I was doing. That made me want to visit her often, even though we were from different generations. Aunt Nance had a well in her yard, a big vegetable garden, and loved to share her biscuits and homemade jelly. Going to her house was like stepping back into a simpler time. I don’t remember her having a television. Conversation was our entertainment. I loved our visits but dreaded seeing her pull shoe boxes out of her closet because that meant we were going to look at old family photos. Many of the pictures were of people I’d never met, but I would try to pay attention and be polite. I was recently telling someone about Aunt Nance and realized that I would give anything to sit down with her and go through some of those shoeboxes filled with pictures today. I would ask her to tell stories about the family members in the pictures. I would ask her if we could label the pictures and make copies for me to keep. My hope at this Christmas season is that we will treasure our time together and make some good memories. Ask the elders of your family about Christmas when they were children. You just might learn some good stories about your family. Let’s give our cell phones a rest and have a conversation with parents or grandparents. Time and attention might be the most valuable gifts we can share. By ozarkmountainhiker in Uncategorized on December 9, 2014 .